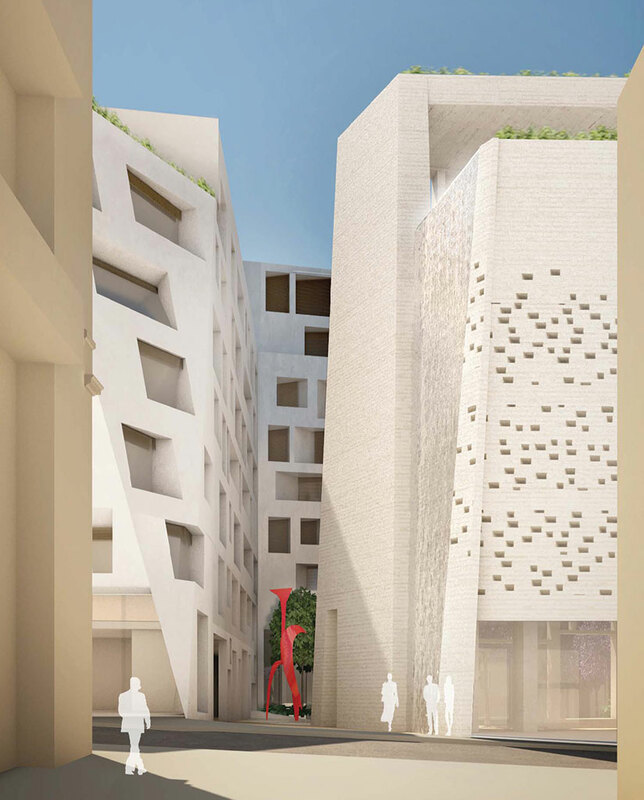 Conceived as the fifth magnet of Beirut city center’s regeneration, the site has a key relationship to the Beirut Souks. Located along Patriarch Hoyek Street, the principal vehicular approach to the Waterfront District, the site is the last segment of the new pedestrian network linking the Hotel District to the commercial city center. The project includes retail, restaurants and cafés, high-end serviced apartments and a wellness center, the future Beirut Spa and Wellness Center. Marino's design achieves a successful massing response to the local context through a well planned arrangement and the introduction of a central courtyard that splits the building mass and creates a public destination within the development. The serviced-apartments wing benefits from direct access at the southwest corner, the calmest part of the site, as well as a clear path to the courtyard with all its associated public elements. A connection at rooftop, offers direct access to the spa, a private roof garden and sun terrace with its spectacular views. The retail component facing Beirut Souks is highly visible and readily accessible from the pedestrian circulation paths, creating a new vibrant commercial area. The retail space, restaurant and café terraces benefit from the additional pedestrian traffic crossing the courtyard. The wellness center features top quality design, equipment and professionals, all geared to cater to a highly demanding clientele. A variety of access points respond to the unique needs of each potential client, and the interior spaces have strong sensitivity to light and privacy requirements.